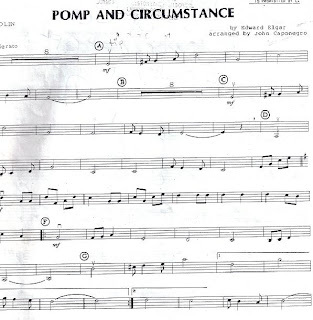 Ignoring Friction: Frequencies of "Pomp and Circumstance"
Most everyone who has attended a graduation ceremony is familiar with the tune of "Pomp and Circumstance" by Edward Elgar. Of course, the majority of those who have heard this lovely classical piece probably know it only as "the graduation song" rather than by its full title. (If you are not familiar with this song, click here to watch a video of it being performed on YouTube.) In any case, the melody can be taken at face value, as a thought-provoking and nostalgic accompaniment to life-changing ceremonies such as graduations. Musicians and scientists, however, might be interested to explore the composition of this piece from the perspective of the physics behind its ability to bring tears to the eyes of even the most hardened grandparent. Music is made possible by the wonderful physical presence of sound waves. Sound waves are caused by vibrations—regardless of the medium through which they travel, these vibrations create small zones of compressed air, which push against tangential air pockets, which in turn push against other air pockets. As this process continues, the sort of “slinky”-like wave that we tend to picture when we think of sound waves is created. In fact, sound waves are compression waves, just as would result if you were to hit the end of a slinky. They are not the waves that move in a snake-like motion, as do waves on the ocean. Among the most important aspects of a sound wave is its frequency, or the number of waves that travel past a given point in a certain amount of time. Frequency is measured in hertz. The higher the pitch of a musical note, the higher its frequency. Musical instruments, such as a violin or trumpet, do not produce sound waves of only one frequency at one time. In fact, they create waves of many frequencies, which are referred to as overtones. These overtones all merge together in the human brain to create one discrete pitch. With modern technology, it is of course possible to measure the frequencies of various notes. Using tables which showcase such data, we can map the progression of frequencies throughout any piece of music for which we have the sheet music. Below is a graph I have created to illustrate the frequencies used in the most famous section of “Pomp and Circumstance.” Below each bar on the graph denoting frequency level is the corresponding musical note. 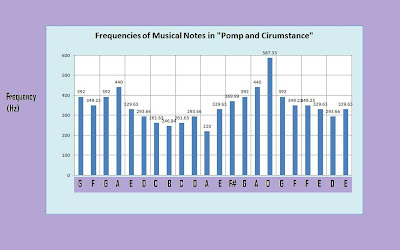 As can be seen in the chart showing the note frequencies in “Pomp and Circumstance,” the higher the pitch of a note, the higher the frequency value in Hertz. So, the next time you are at a graduation ceremony and hear the band strike up the opening chords of Edward Elgar’s timeless classic, perhaps, rather than singing along, you can chant the frequencies of each note (which you now know is made up of multiple frequencies which your brain resolves into one easy-to-comprehend note) out loud. Here is an image of the sheet music for this piece. Note how the frequency levels move in a similar pattern to the notes on the musical staff!